Please call to book a group tour of five or more people. the closing of the factory. Collectors agree, The House of Glass conceptual art glass paperweights and other uniquely designed creations are among the finest in the world. Stunning, professionally crafted art glass is created for the serious collector and hobbyist alike. The highly detailed, meticulously crafted, colored glass content is encapsulated in brilliant optical quality crystal. Our reputation is founded upon the fine, delicate, floral art glass paperweights that have been highly sought treasures among collectors for years. 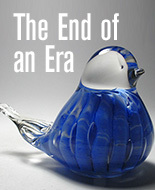 Joe Rice and his skilled craftsmen have been creating designer art glass for over 20 years. He continues the rich St. Clair family tradition founded by his grandfather John “Pop” St. Clair in Elwood, Indiana. They are well schooled in old-world techniques while embracing the expanding area of contemporary glass art. Please peruse our picture gallery of products, dedicated to our ever developing line of glass art. You will find antique and modern style paperweights, animal sculptures, ring holders, vases, marbles, lamps, glass jewelry and other diverse forms of glass collectables and gifts. Whatever your unique glassware preference, The House of Glass looks forward to creating and delivering to you museum quality art glass that collectors desire at a price that anyone can appreciate. The House of Glass art glass products are offered through our direct store sales, with contact information available on the “contact” page of this website. The House of Glass works with glass, art glass, glass etching, glass gifts, hand blown glass, blown glass, stained glass, paperweights, paperweight, paper weights, crystal paperweights, glass paperweights, decorative glass, glass paperweights, glass lamps, glass vases, glass bowls, and glass artist. The House of Glass is famous for our heritage related to St. Clair art glass, currently found under the trade name of Joe Rice. Joe Rice is the grandson of John St. Clair. Many of his pieces will be marked with Joe St Clair. Maude and Bob St. Clair art glass is also popular with collectors.